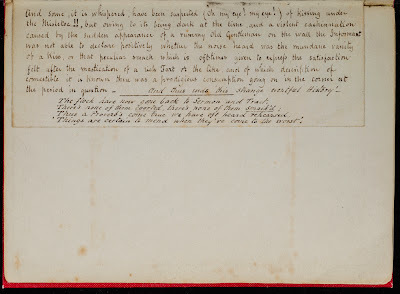 BOOKTRYST: Has An Unrecorded Thackeray MS Gift Book Been Discovered? Interesting and Curious Rare and Antiquarian Books, &c.
Has An Unrecorded Thackeray MS Gift Book Been Discovered? 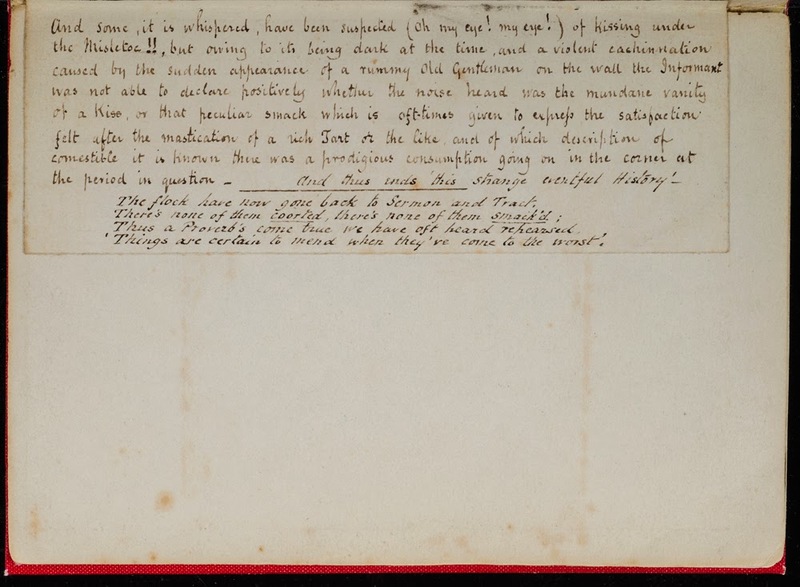 A small manuscript book with original art purportedly written and drawn by William Makepeace Thackeray (1811-1863), the great nineteenth century English novelist, has surfaced. There are no references to it in any bibliography, biography, or collection of Thackeray's letters. 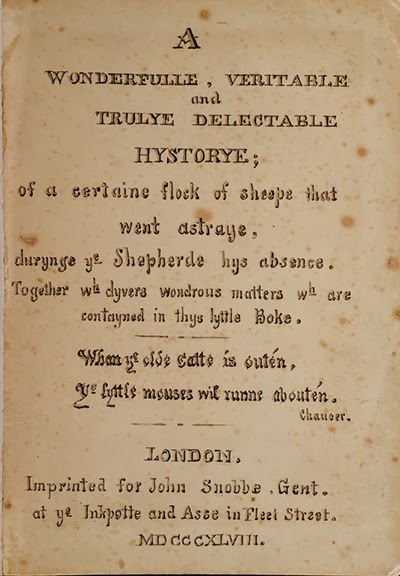 Titled A Wonderfulle, Veritable and Trulye Delectable Hystorye; of a certain flock of sheep that went astray, during ye Shepherde his absence. Together wh. divers wondrous matters wh. are contained in thys little Boke, it was "published" in London by "John Snobbe Gent. at ye Inkpotte and Asse in Fleet Street" in 1848. In 2013 it appeared on my desk and, the object of near total Thackeray immersion, it has been under investigation for the last three months. The case for WMT's authorship is strong yet circumstantial and the jury remains out. The book is composed of seven leaves of pale blue writing paper, each 7 1/4 x 5 3/16 inches (185 x 127 mm), with recto-only holograph captioning below colored drawings that were rendered on artist's paper, clipped, and pasted in. 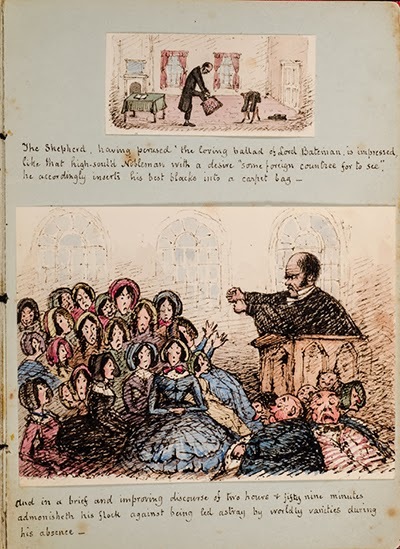 A gentle satire, with charming wit it tells the story of an English parson who visits the Continent but not before warning his congregation against being led astray by worldly vanities while he is away. Compelling news from home returns him to England where he discovers that his flock has, indeed, flirted with the devil and succumbed to the vanities that contemporary society draws the unwary into. There are three possibilities as to the book's origin: by Thackeray; a Thackeray pastishe by an anonymous someone; or a forgery. It is not a forgery; a forger would have signed Thackeray's name or initials in an attempt to deceive. There is no identifying signature, or initials. The paper and ink are true to period. Internal text details nail the date to, indeed, 1848. And merry little children's books at times. The title page is a riot of archaic and curious word spellings. From Thackeray's letters we know that he enjoyed playing with spelling, and he commonly used "wh." to abbreviate "with" and "which," as here. The "John Snobbe" imprint is highly significant. In 1847 Thackeray serially published The Snobs of England; in 1848 a revised book edition was issued as The Book of Snobs. Thackeray created and popularized this class of individual and our current definition of snob is based upon Thackeray's conception. We can chalk-up the imprint's location - "at ye Inkpotte and Asse" - to Thackeray's self-deprecation and his negative feelings about writing. Like Dorothy Parker, he enjoyed having written but didn't enjoy the writing process. "At ye Inkpotte & Asse" is the lightly grumpy and sarcastic equivalent of slaving in the salt-mines. In The Book of Snobs, Thackeray devotes a chapter to the clergy, and a clergyman is here the object of the satire. The allusion to Lord Bateman in the second leaf's first line is significant. 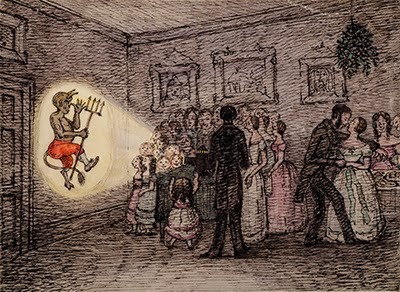 Thackeray was a fan of the traditional story of Lord Bateman and wished to adapt a version of his own. 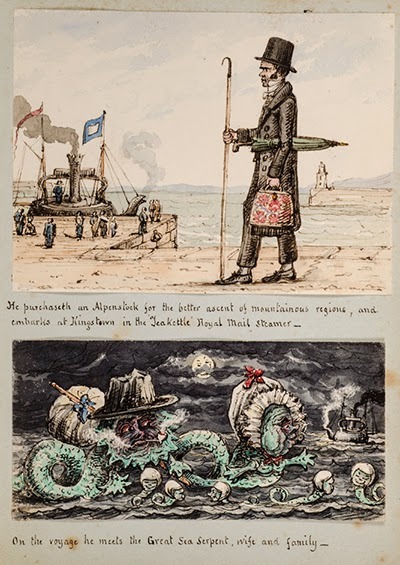 He shared this desire with caricaturist George Cruikshank, who warned him not to; Cruikshank was planning his own, and The Loving Ballad of Lord Bateman was published in 1839 with notes by Charles Dickens. Thackeray, however, never got the story out of his head and later composed The Famous History of Lord Bateman, with his own illustrations and text variations. The second leaf text refers to being "led astray by worldly vanities." We're in Thackeray territory here; Vanity Fair had been serially published 1847-48 and the book edition was issued in 1848. In the forth leaf reference is made to a trip to Germany. Thackeray visited Germany in 1848 (he had spent time there earlier in life). The parson reading Galignani's newspaper is noteworthy: it was the leading English-language newspaper on the Continent and, significantly, Thackeray had been a contributing writer to it. The reference to "news of a most horrifying nature" refers to the Young Irelander Rebellion, which occurred in late July 1848. Reference in the fifth leaf to a Jenny Lind concert - We know from his letters that on June 3, 1848, Thackeray attended a Jenny Lind concert in London. On the wall in the sixth leaf's illustration is a portrait of French minister Louis-Eugene Cavaignac, the de facto French head of state and dictator in the immediate wake of King Louis-Philip's abdication during the June revolution of 1848. The final leaf's tableau presents a social scene worthy of Thackeray's wit: is the loud smacking sound that of a kiss or someone smacking their lips in satisfaction of eating a rich dessert? The illustration at far left is amusing - a man seems to be going in for a kiss with a young lady while simultaneously reaching behind her to grab something off a food tray. Festivities At Clontarf Splendid reunion……..
demise of his granduncle the Man thereof…&c. &c.
At first glance they appear to not be by Thackeray. They are more developed than is usually the case with his illustrations. Thackeray was, in his mind, first and foremost an artist; it was his first love, what he did for pleasure, and his ambition in life was to become a painter; writing was a chore he did strictly for the money. 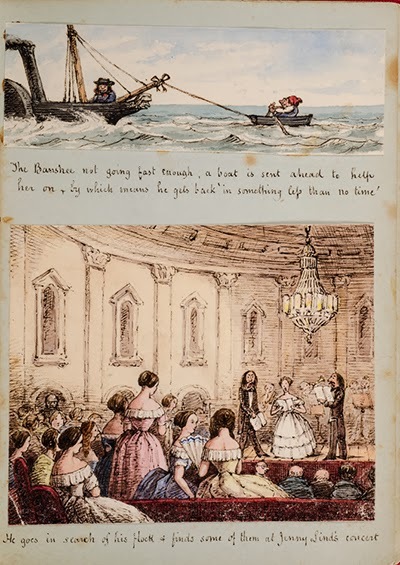 But as John Buchanan-Brown's The Illustrations of William Makepeace Thackeray demonstrates, Thackeray's artwork varied from simple line drawings to more elaborate compositions. (His draftsmanship and technique were limited; he had to quit his art studies after he squandered his inheritance and had to earn a living, pronto). Given the time and motivation it is entirely possible that he created these illustrations. Noteworthy in respect to technique is that when he designed crowd scenes or groups of people their facial features were generally rendered as simple dots or dashes, as seen in the second leaf. This same detail is found throughout Thackeray's illustrations. So, too, Thackeray's variation of visage, often caricatured but sometimes, as here, somewhat straight without exaggeration or grotesquerie. her on + by which means he gets back in something less than no time! Purchased by John Ruston of the Horace G. Commins Bookshop located at 100 Old Christ's Church Road, Bournemouth, Dorset, from the Chadwick family of Sherborne, Dorset. Purchased from Ruston by Jack Joseph of E. Joseph Booksellers of London in 1965. In descent from Jack Joseph to his nephew, bookseller David Brass. Maj. James Chadwick was an old friend of Thackeray's. Thackeray created his Alphabet Book for Chadwick's son, Edward. At first glance, the handwriting is not what we expect of Thackeray. Though the penmanship here is as minute and precise as found in Thackeray's letters, there are a few details which concern. Thackeray's downstems (below the line, as "g" or "y"), for instance, are typically straight; here they curve to the left with a flourish. The illustrations are too well-done. Thackeray was too busy during 1848 to create this little book. He was up to his inkpotte & asse writing Pendennis. Thackeray used a standard pen nib when writing his letters. The designer here uses an artist's pen with thin nib, allowing for flourish. 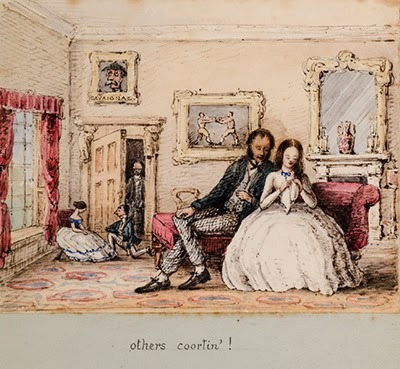 These illustrations are finer than most that we see of Thackeray's and he might very well have artistically varied his handwriting to suit the occasion. 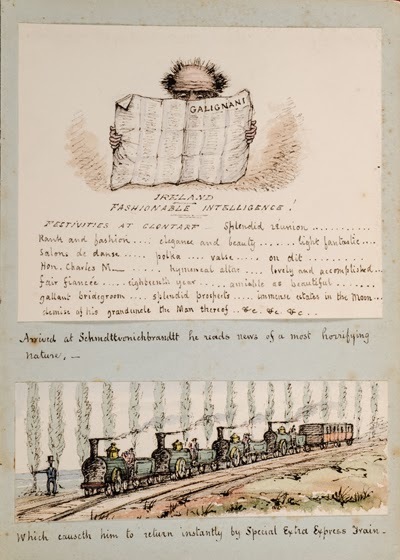 Variations in penmanship style - sometimes for amusement purposes - are found between his letters, and between captions to his illustrations. Thackeray used a straight and slanted handwriting style. Both are present here. While it is true that Thackeray was deeply immersed in writing Pendennis during 1848 and perhaps too busy to devote his energies elsewhere, it is also known from his letters that Thackeray quit Pendennis for brief periods of time. Again, writing was toil for him and he might very well have taken time to do this book simply for diversion and relaxation to reinvigorate his creative powers. The question arises: why would someone anonymously create a one-off Thackeray pastiche in the first place? It's too good to not wish to be associated with it; pride of authorship is warranted. Thackeray had no need to sign it; as a gift the recipient (a member of the Chawick family, possibly James) knew who did it. How would an anonymous author (and clearly trained artist) have known of Thackeray's interest in the Lord Bateman ballad? His affection for unusual spellings? His Galigani connection? The Jenny Lind concert? Too many coincidences; the circumstantial evidence piles up. Things are certain to mend when they've come to the worst! John Aplin, Thackeray family biographer and curator of the Thackeray Bicentennial Symposium at Harvard's Houghton Library in 2011; Victorian literature scholar Kurt Harris, Ph.D; and Peter L. Shillingsburg, general editor of the Works of W.M. Thackeray; author of William Makepeace Thackeray: A Literary Life, etc., were consulted. Mr. Aplin is sanguine about Thackeray's authorship. Dr. Harris wrote, "The drawings and handwriting in the images you sent me appear to be those of W. M. Thackeray." Mr. Shillingsburg is dubious: "I have seen a number of iffy manuscripts and this one did not convince me but 'attributed to' is accurate." In 1972, Gordon N. Ray (1915-1986), editor of Thackeray's letters, was consulted. It is reported that he glanced at the book's second leaf for a moment and without investigation declared that it was not by Thackeray. The handwriting was, apparently, all he needed to see and he didn't instantly see Thackeray. I am told, however, that Ray, at this point in his life aging, irritable, and cantankerous, was a bit of a cuss about the matter, refusing further and deeper examination of the book. With all due respect to Ray, however, experts after their great successes can sometimes mutate into rigid doctrinaires inflexible to anything that might contradict their experience. Mr. Ray may have been correct. But he may have been completely wrong. The provenance should definitively settle the issue but, alas, there is no paperwork to document Ruston's purchase from the Chadwick family, nor a bill of sale from Ruston to Jack Joseph. There is no smoking gun, just the scent of gunpowder and traces of it on Thackeray's hand. I admit to scholastic bias; I want this to be by Thackeray; it excites the latent academic and ignites the thrill of exploration and discovery. It is so very cool. And, without putting too fine a point on it, if accepted as being by Thackeray it's a book whose value is in five-figures. The matter is now left to academics, bibliographers, and collectors. Whatever the result, this is one of the most fascinating pieces of Thackerayiana to appear in a very long time. Images courtesy of David Brass Rare Books, with our thanks. This item is not currently for sale. "All Women's Colleges Should Be Burned"